Whether buying whole texts, curating digital content or writing their own, educators want flexibility and reliability — which often means having printed materials on hand. The New Media Consortium's 2014 Horizon Report K-12 Edition noted that although digital textbooks have become a mainstay in higher education, they have been slower to infiltrate K-12. The report's authors added, however, that the "financial and educational benefits of digital learning materials will eventually outweigh the outdated paper textbook dependence in K-12 education, and gradual adoption of digital textbooks is expected." THE Journal recently spoke with teachers and administrators in several districts that are experimenting with digital versions of textbooks from traditional publishers as well as those curating digital material to compose new, more personalized texts for their students. From their responses, it is clear that the promise of digital texts has been matched by frustrating deployment issues. As with many newer technologies, the earliest adopters were going to take the arrows. And that is what happened to Virginia's Fairfax County Public Schools, which has been working with digital textbooks in world languages, mathematics and social studies for more than five years. Craig Herring, the director of preK-12 curriculum and instruction, said the district made the mistake of thinking it could do away with hardcover social studies books, buy everyone a license for an online version and then have classroom sets of hardcover books for students who might have trouble accessing the online text. "When we rolled it out, we went to classrooms to see how teachers were using them," he said. "The teachers were resistant and the kids were resistant. We found that the eleventh- and twelfth-graders really hated it. We hypothesized that they had set their study habit routines and didn't want to change them." The teachers did not think it was a better way to go instructionally. "By the time the kids started up the laptops in class and the teachers resolved any technical issues," he added, "they thought 'I just wasted 15 minutes of my class when they could have just opened their book.' "
The district rolled out digital math textbooks three years ago, and found they had more interactive elements and videos, said Rose Moore, the preK-12 mathematics coordinator. But usage still varies from school to school and teacher to teacher. The district also purchased hardback copies for 40 percent of the students, and since then some schools have purchased more. "When we first rolled out the math textbooks from Pearson we had tons of problems," Herring admitted. The district approved the digital textbooks for more than 150,000 students over the summer "and just turned it over to teachers in the fall and said 'Have at it.' Well, teachers knew how to put a book down in front of a student, but when you talk about issues of getting online, passwords and troubleshooting which platform the student is using, it was a nightmare," he said. "We spent a lot of time trying to figure out the technology piece of it and that hampered the use of the instructional piece in the first year. We had very little usage. We didn't have our ducks in a row and it really hurt us." One major problem was that teachers had to go into the online system and register each student, which took a lot of work. Through a glitch with Pearson, Herring said, all the students' registrations were erased. The teachers had spent all this time inputting their 150 students, and now they had to go back and put them all in again. Despite these problems, Moore said the district has gained some momentum each year. "We have not had the level of implementation we would want, but it continues to pick up every year." They are also using the lessons they have learned to prepare requests for proposals for digital textbooks in the future. "We are telling digital publishers we are not going to look at your product if you don't have a way to automatically register students from our student information system," Herring said. They won't sign contracts as long as six years again. "We are not going to deal with you if you don't have support phone numbers for students and parents after 5 p.m. And they have to be more platform-agnostic, so students can access it from whatever device they want to use." Moore added, "Instructionally we also have implemented a new needs assessment from teachers. Before we even look at the textbooks we want to feel that we understand their needs for the resources, and build that into RFP." Janet Hurst, a sixth-grade teacher from Corinth Middle School in Mississippi, has begun curating her own content for students using a solution called icurio from Knovation. It features more than 330,000 open educational resources for all K-12 curriculum areas, contextualized by educators and aligned with state and Common Core standards. Last year the district began a 1-to-1 initiative that provided a laptop for each student. Hurst said she was drawn to icurio because of the resources it has available. "You spend a lot of time looking for great resources," she explained. "The fact that they had compiled so many great resources in a place where we could build lessons and present them to students and differentiate it, all of that together in one place was interesting." Hurst said she doesn't necessarily see icurio totally replacing the need for a textbook. "I personally don't believe that it is best for students to be only tied to a technology device. It does open up so many possibilities for them as far as research and personalized learning, but I don't see it completely eliminating other things. In a science classroom, I would want those text resources available — maybe not passed out to all students, but have them available." Hurst said she does like the flexibility the platform offers to try new content and lessons. "Even if you teach the same grade level every year, you have a different group of students every year, so it is nice to be able to go in and tailor it to your own students and not have just a cookie-cutter curriculum," she said. "The nice thing about icurio is that the resources have been vetted, so you know there won't be anything inappropriate for students or links that don't work." Travis Lemon, a seventh- to ninth-grade math teacher at Utah's American Fork Junior High, is working on a project to create an open source digital math text to match up with new teaching standards in the state. As Lemon and his colleagues started to create professional development material to help other teachers understand the standards for mathematical practices, they just didn't find materials that would embody that vision, either in the traditional textbook world or in OER material. A lot of the OER materials for math at that time didn't incorporate the practice standards and were quite traditional in nature, Lemon said, so the Utah math teachers decided to start authoring what became the Math Vision Project themselves. "It incorporates research of the last 20 to 30 years in math education," Lemon said, "as well as efforts to make math more accessible to all students." "As we were writing it in 2012, a few of us were using it in our classrooms and getting feedback," he said. "There was such a need for materials that we were getting things out as quickly as we could. We have gone back and made revisions." Lemon said that one advantage of a digital resource is that you can revise it as often as you like. "It is more responsive than a traditional paper textbook that often isn't updated for five to seven years, depending on their publishing cycle," he said. On the other hand, in the digital age people tend to expect you will make those changes overnight. "There are advantages there, but also growing expectations, which are hard to satisfy," Lemon said. Despite the text being digital, Lemon's students don't have ubiquitous digital access to the materials. "I am still printing it out and using it that way," he said. "I can't rely on all my students having devices yet, but we are moving in the direction and it will only be a few years before I have 1-to-1 devices for students." 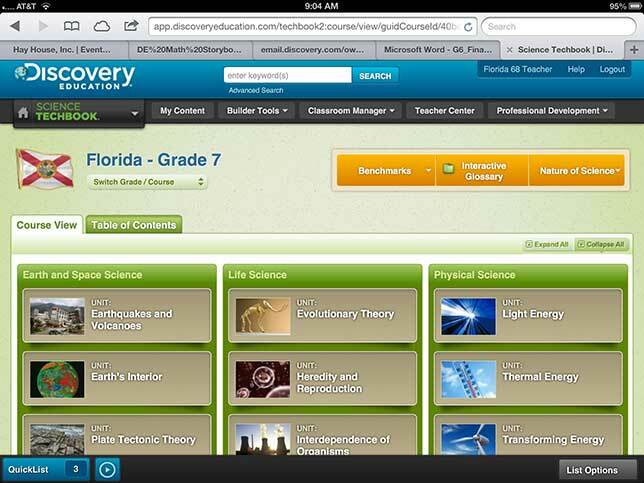 Kim Gartner, a seventh-grade science teacher at Hilton Head Island Middle School in South Carolina, has been using Discovery Education's digital Science Techbook for the past two years. "I think it has been an improvement over the print textbook," she said. The Techbook includes a combination of videos, photographs and audio recordings. Students can highlight text and have it read to them aloud. They can add sticky notes to key passages. Text can also be modified for different reading levels, viewed in Spanish or printed out. "I had to teach my students how to access it," Gartner said. "It took some training just to get them used to searching for information and where to find videos if they need more help. Gartner said she prefers the Techbook to putting the onus on each teacher to pull together his or her own OER material. The idea is to provide diversity within the classroom using the one resource, so everyone can have common assessments, she explained. "Too many choices might make it more difficult. We have all three seventh-grade science teachers on the same pace following a curriculum map." She said some teachers have been reluctant to use digital textbooks, but she likes to jump in when she gets the chance to try something new. "You can't deny the technology to students," she said. "That is going to be their future. Everything will be digital."